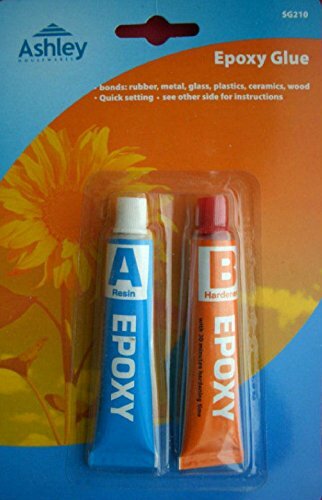 Top Quality Extra Strong 2 Part Clear Epoxy Glue.Fast and effective bonding for..PlasticsMetalRubberWoodCeramicsGlassEpoxy Glue is the worlds fastest toughest mender. It has tremendous strength and durablity.Just mix and apply.Makes extremely strong bonds.Works great for filling gapsand holesas it hardens to a rigid metallic mass.Makes durable lasting repairs to lawn mowers machinery appliances tools and vehicles. Bonds any metal to itself or to another metal.Also fastens wood glass ceramic and concrete to themselves or to each other.Chemical resistant and dries to a clear finish.Not recommended for flexible materials or polythene and will not conduct electricity.Non-Shrinking.Sets in 30 mins.Instructions and health and safety info detailed on the back of the card.Ideal for Home Office or Workshop.Supplied sealed and retail packed with two tubes and mixer.